You’ve heard it before, and you know it’s true: Getting old is no cakewalk! We’re trying to keep our heart and our organs healthy, thinking about protecting our skin, making sure we’re eating clean and then, oh yeah, what’s up with this new “soft” body I didn’t have back in my 30s and 40s?! Yes, it’s true: unfortunately, muscle is harder to build and maintain as we age. But the good news is, it is possible! Most important thing to remember as you age: muscle fights fat. 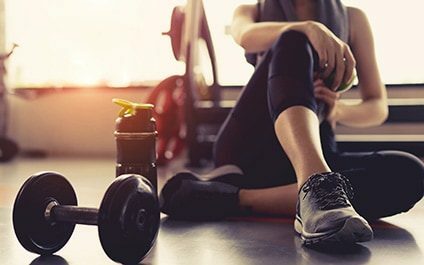 That's right; the more muscle you have the faster your metabolism and the more fat is burned without even trying, let alone when you are exercising. This is even more important as you age for some a very crucial reason: we lose an average of more than 6 pounds of lean muscle mass for each decade of life after 20…this leads to some more depressing news; this loss of muscle mass decreases our metabolism by 3-8% each decade— ya’ll, these 2 things are not mutually exclusive! So one HUGE reason to up the weights and stick with weight training throughout your life: building more muscle mass will help you keep a healthy metabolism through each decade of life and keep that weight from creeping up. This study alone should be evidence enough to realize the importance of building strength. But wait there’s more! In addition to the metabolic benefits, strength training, according to a study from UCLA, lowers your risk of death; the more muscle mass you have, the less likely you are to die prematurely. The muscle you are creating through strength training is literally expanding your life! One key benefit for strength training I want to hone in on is the effect strength training has on your bones, especially for women. Women lose bone density fast as they age, especially if they are not taking preventative measures to delay the progression. Your bones are constantly being rebuilt every day in a process that involves the removal of old bone and regeneration of new, healthy bone. Weight bearing exercise (any exercise that requires you to move your body, a weight or resistance against gravity) works to build stronger bones by stimulating cells responsible for the synthesis and mineralization of bone, and is actually one of the most effective remedies against osteoporosis (bone loss), because as you put more tension on your muscles it puts more pressure on your bones, which then respond by continuously creating fresh, new bone. So in other words when you are working against a resistance, whether it be weights or your body weight, you are building stronger bones. This could be weighted exercises, like what we typically think of dumbbells, barbells, or weight machines at a gym. I would like to include the Pilates reformer in this category as well; while it is not often seen as a ‘weighted’ exercise, the use of resistance springs still makes this a ‘strength building machine’ and exercises being performed are considered ‘weight bearing exercises’. These weight bearing exercises can also be body weight training, those exercises using just your own body weight as resistance.